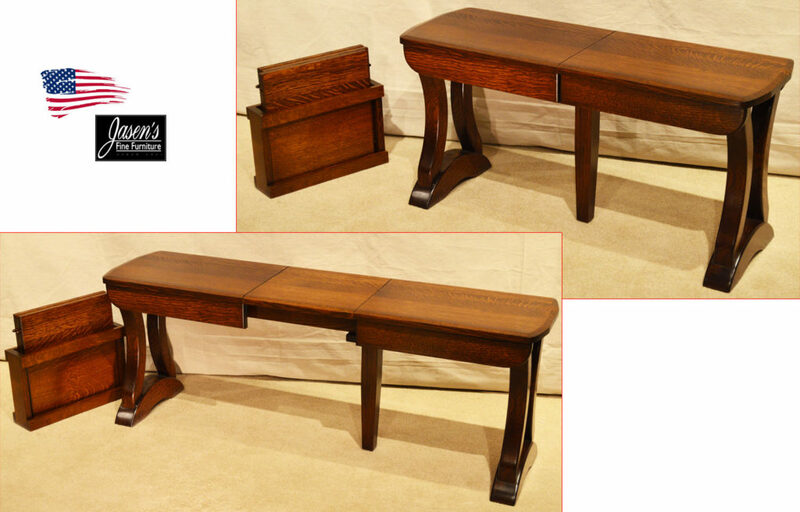 The Amish Richfield Bench is functional while matching any table. The Richfield Bench makes for efficient, yet practical seating. The bench looks best with the Richfield table while it can also be paired with others. The Bench can be ordered in dozens of stains while being available in a variety of woods. The leafs come with the bench which consequently allows multiple seating arrangements. The bench shown is in the ever popular Quarter Sawn White Oak with Asbury stain. The bench can be ordered in larger sizes. There are 11 total styles of benches to choose from. The Richfield Bench is Amish Made, thus Made in the USA! Size: H-18″ W-36″ D-12″ Extends 48″ to 72″ with three extensions. 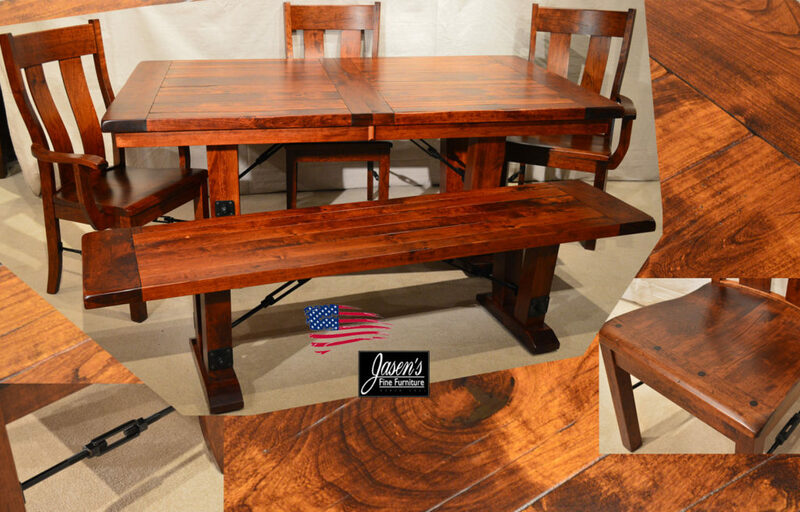 The Amish Galveston Bench is functional while matching any table. The Galveston Bench makes for efficient, yet practical seating. The bench shown is in the ever popular Brown Maple with Michaels stain. The Galveston Bench is Amish Made, thus Made in the USA! Amish Round Top Trunk features timeless, yet unique style. Features unique, yet classic design. The trunk has planked construction in solid cherry. The antique brass latches and rivets also add to its charm. It’s straps make for an almost Old World look. Consequently the trunk comes in a flat top also. In addition to cherry the trunk can be ordered in many other wood species. Finally, the trunk can be ordered in any stain color of your choice. Other heirloom touches that can be ordered include custom engraving. The trunk is Amish hence Made in USA! 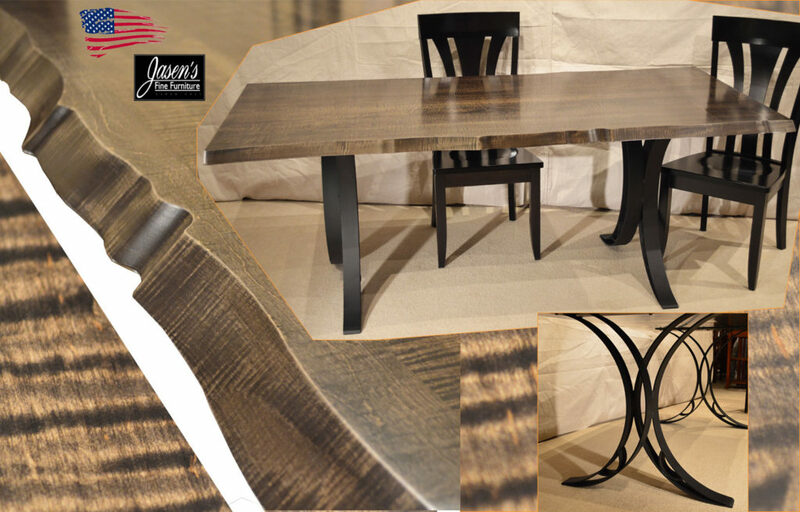 Amish Barn Floor Dining Table feature modern, yet rustic style. Barn Floor Dining table features rustic, yet modern barn floor appearance. Table features almost aged look with its scoring, mill marks, and scalloped edges. Other unique features of the set in addition to its rustic appeal are the iron turnbuckles. Most noteworthy is the table’s versatile option for seating. The featured bench is optional, but provides ample seating while adding to the rustic charm. Finally, the table is solid Rustic Cherry that features random filled knot holes! The set can be ordered in a almost limitless variety of wood specie, color, and sizes. 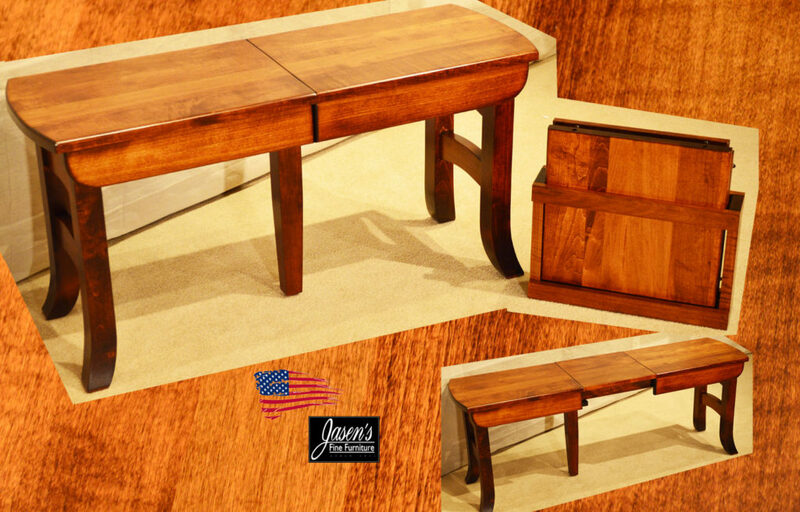 Table Shown: 44″ * 72″ extends to 90″ with leaf. 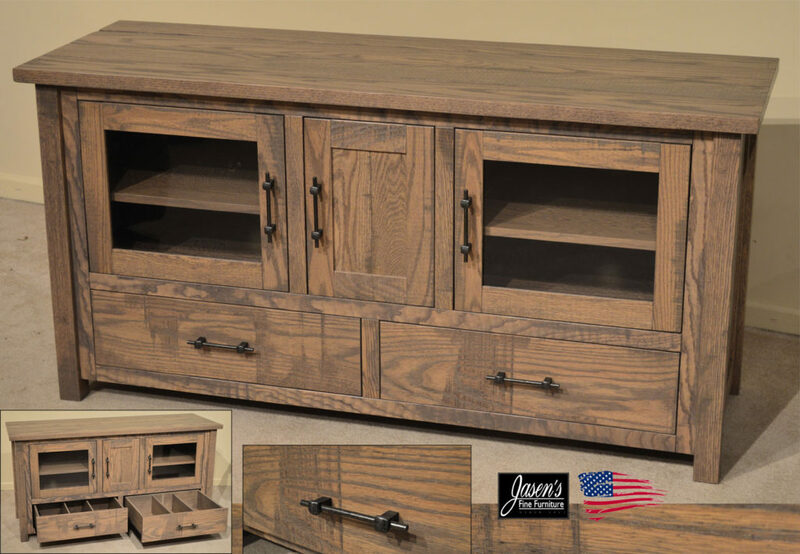 Amish Oak TV Stand features transitional lines, yet in a traditional Oak. 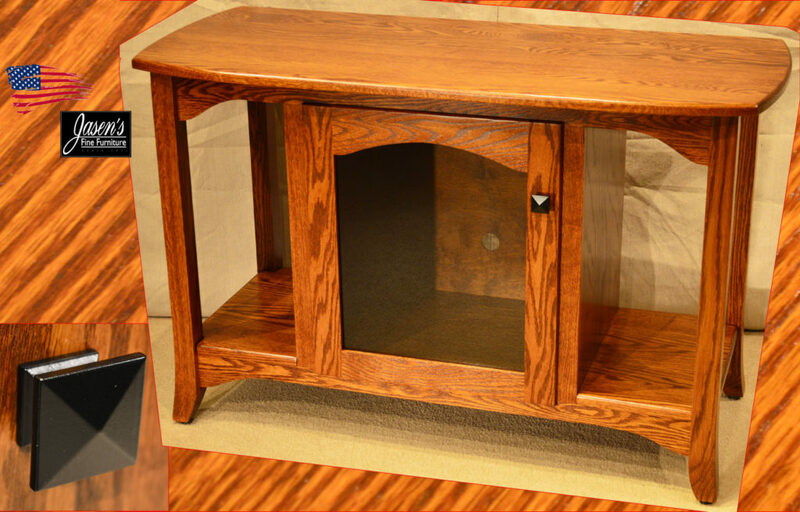 Oak TV stand features transitional style while featuring traditional Oak. The piece has an open feel instead of the standard closed in construction. Behind the glass doors includes one adjustable shelf and a cord hole in the back. Size featured is 29.5″H 46″W 20″D. 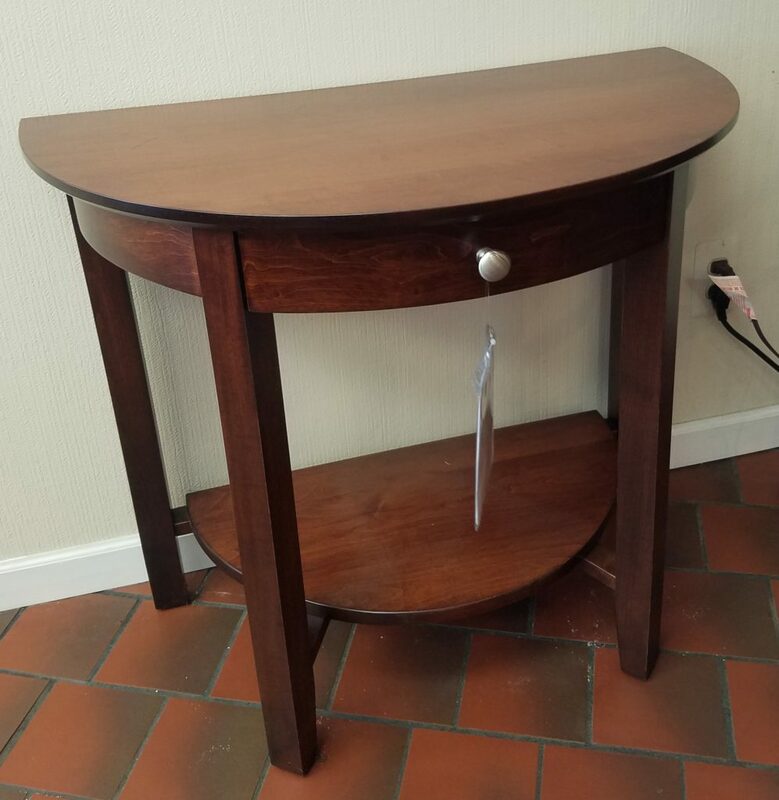 Amish Maple Console – $299. 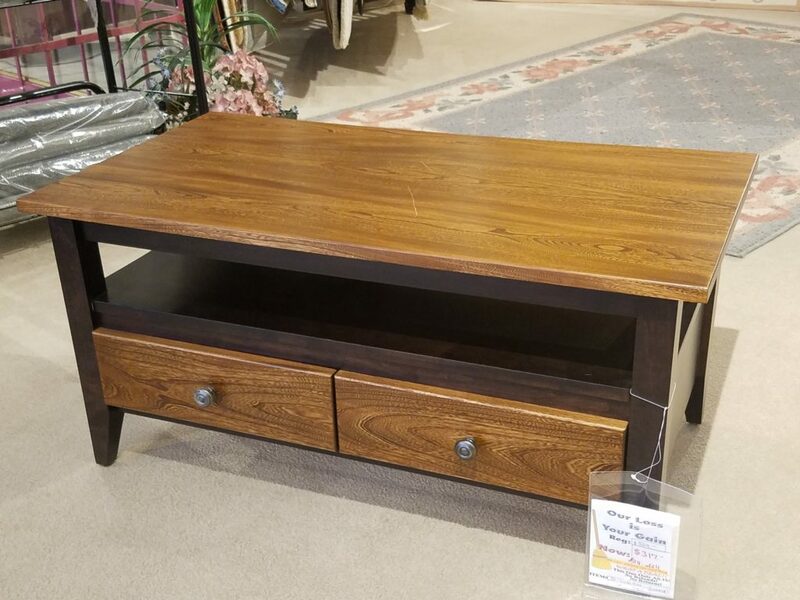 Amish Elm and Maple Coffee Table – $317. 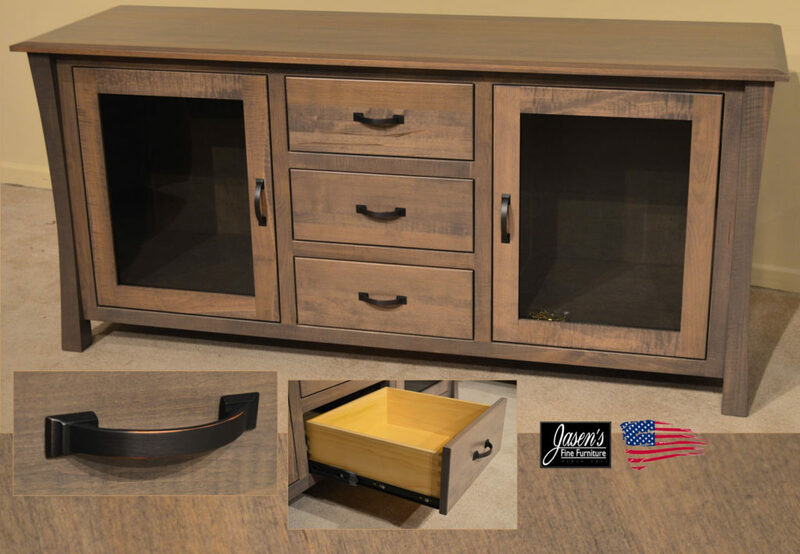 Amish Driftwood TV Stand features elegant curved post legs, full extension drawers, and smoked glass doors. The TV stand offers modern style, color, and and functionality for your new flat screen television. The Driftwood TV stand is constructed of completely solid brown maple. The TV stand is available in any wood specie of your choice including oak, maple, cherry, and quarter sawn white oak. Once you have selected your favorite wood you can pick from a large variety of stain colors! The hardware shown is a brushed gray with oil rubbed bronze on it’s edges. There are 100’s of different types of hardware available for the TV stand upon special order. The piece is also available in different sizes or it can be ordered in any dimensions. Amish rustic gray TV stand features full extension glide drawers, straw glass, antique iron hardware, and an overall rough appearance. The rough styling starts at the top of the TV stand with it’s plank barn floor style, knot holes, and mill marks. The mill marks, knot holes, and rounded edges appear throughout the rest of the piece in thoughtfully placed areas. The TV stand can be ordered in any wood specie, color, and hardware of your choice. The wood species available on the TV stand include oak, maple, cherry, quarter sawn white oak, and rustic cherry or quarter sawn white oak. Hardware choices for the TV stand number in the hundreds for a nearly unlimited selection. The TV stand is Amish and entirely made in the USA!